My name is Cassie and I’m almost 17 years old. I’m writing to tell you about my brother who has autism, and a special bike that made a drastic change in his life. At the age of three my brother, Jesse, was diagnosed with severe autism. At the time, I was only five, and of course didn’t understand anything about the disorder. However, neither did my parents. My brother could barely talk, and to this day, at age fourteen, has a very limited vocabulary, maybe consisting of 75 words at a maximum. For years, my parents struggled to find a school that would suit his needs, but their efforts all failed, and in June, 2000, they founded a school for children with autism called the Victory School. Although his disability was extremely difficult to cope with, it opened up our hearts to the world of autism and other special needs, and in the process brought our family closer together in an unimaginable way. By himself, Jesse managed to find something that everyone in my family would enjoy, and that was cycling. Jesse didn’t learn how to ride bikes on a tricycle, but instead learned immediately on a two-wheeler. However, as a result of his autism my little brother didn’t understand the idea of traffic and signs, and as a result it was too dangerous for him to ride alone. Bicycling was the one thing that made him smile and laugh more than any other activity, and my parents didn’t want to take that away from him, so they purchased a “tag along bike” for him to use. This attached to the back of my dads bike, and consisted of pedals and a handlebar for him to use. But because the younger child sits in the back while the adult is in the front my brother couldn’t see anything except my dad’s back, and he could get away with not pedaling for my dad couldn’t see whether or not he was, and in some cases he wouldn’t even hold on to the handlebars. On November 29, 2003 my dad purchased a used tandem bike, called the “Love Bike” from a neighbor. The Love Bike was extremely different than any other one he had ever used, because on this tandem bike, the child sits in front of the adult, and has his or her own handlebars, and their own set of pedals, and even brakes. After the first time on the bike, Jesse’s face glowed with happiness. Every weekend, he would run upstairs to my parent’s room fully dressed and even in socks and sneakers (even if they were on the wrong foot), holding his helmet and would say, “Bike, Bike, Bike.” If my dad didn’t get up right away, he would go to his side of the bed and hand him the helmet, continuously saying “Bike” repetitively. After my dad got ready they would go on their eighteen-mile bike ride. I’ve never seen my brother smile so much. My dad eventually purchased the patent for the bike in my brother’s special needs trust, and decided that it would be beneficial for so many other children with and without special needs. He later named it the “Buddy Bike”. Since then, many diverse families and many special needs children around the world are enjoying the Buddy Bike. Many families have been impacted by the Buddy Bike as you will see by reading the Customer Comments. Being only two years older than Jesse, I was impacted by his autism more than my older brother and sister who were six and ten years older than Jesse. I had to witness his tantrums, yells, screams, and even hits more, while they were away in college or indulged in high school and its parties. Yet, in my own way, I am thankful I managed to be so close to him. He opened up my eyes to an entire new world and I believe he made my heart much bigger because he made me much more understanding of children and adults with special needs, and for that I find myself lucky. 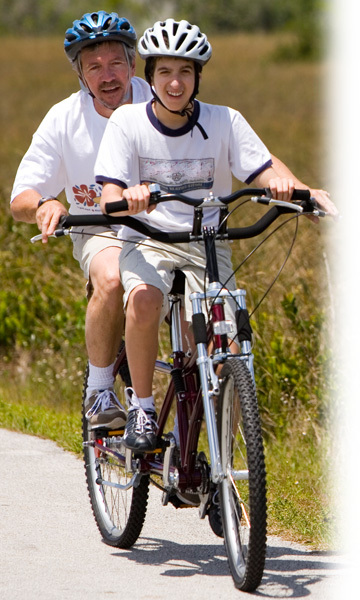 The Buddy Bike changed our lives, managing to bring our family together especially when we all go to the Everglades, and ride in Shark Valley National Park on our fourteen-mile ride, or along Hollywood Beach as a family. Just as it changed our life, it can change so many others, and even yours.